Question: What’s the difference between fluff and transitions? Answer: Transitions enhance cohesion, fluff breaks it. 2) adding thoughts irrelevant the rest of the content. As an editor trying to produce actionable, simple, high-quality content—I often tell writers to avoid fluff at all costs. But sometimes this backfires. Sometimes in an effort to avoid fluff, they write incohesively. What is incohesive content? Well, it’s the opposite of cohesive content. Content should tell a story. Even non-fiction should have a linear path; a path from ignorance to understanding. Content is cohesive when one thought flows logically from the thought before it. The greater the distance between thoughts, the harder the content is to understand. Incohesive content reads like a list of separate thoughts, instead of a narrative. Comic books are a great example of cohesion. 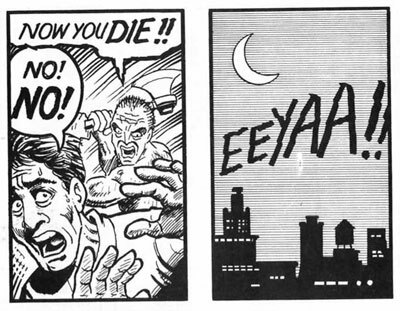 In Understanding Comics, Scott McCloud shows how the action in a comic book actually happens between the frames. The character doesn’t die in the images. But we assume it, and sometimes even illustrate it in our minds, from one frame to the next. Good writing does this too. We want to digest the story as quickly and painlessly as possible. But we don’t want to work hard between thoughts to stay on track. The amount of transitions your content needs depends on the complexity of thought you’re covering. But fluff is different than transitions. Fluff is regurgitation. Fluff is the rephrasing of already stated ideas. Fluff pauses the story, or takes you a step backwards in the story. Sometimes fluff has nothing to do with the story at all. Sometimes it’s just a tangent. 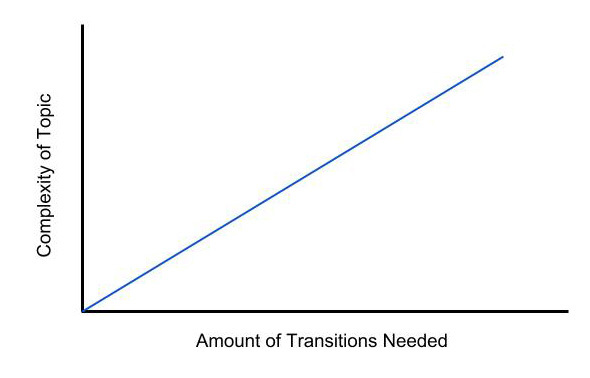 So how do you know if you need transitions or you’re just adding fluff? It’s tough. Good judgment about writing comes from making lots of mistakes. read the entire content out loud. If you get bored or distracted while you’re reading, you’ve fluffed it up. If you’re struggling to keep rhythm in your voice, you need to add transitions.